BANFF, ALBERTA—Canada—Located within easy driving distance of Banff, Canmore-Kananaskis country, Calgary and Edmonton lies the Red Deer River. Originating from the eastern slopes of the Canadian Rockies inside Banff National Park, the Red Deer River gives visitors the chance to explore rugged foothills and spy wildlife in its natural habitat. Spend the day with our experienced guides as they lead you down some of the most exciting whitewater in the province. Note:This trip can only be run for groups of 20 or more. For those that only want a taste of the Canmore-Kananaskis whitewater rafting experience, we offer a 2.5 hour trip that will whet your appetite. 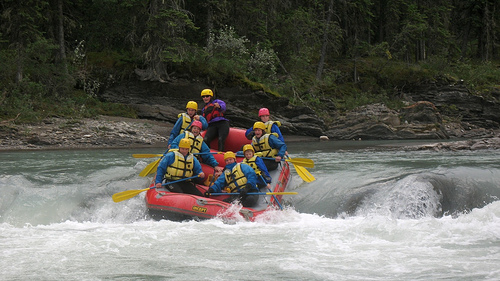 A full day of rafting on the Red Deer river—the perfect addition to any Canmore-Kananaskis vacation in the Canadian Rockies. Great for any experience level! You will arrive at 10:30am at our base camp to familiarize yourself with our guides and the area. At 11:00am, lunch will be served, where release forms will also be signed. You’ll be given a short orientation for the rafting gear as well as a safety briefing for the trip before departure at 12:30pm. At the end of the trip, you’ll be transported back to camp by bus to enjoy the camp facilities. For more fun-filled Banff activities, including rock climbing, horseback riding, and hiking, check out Banff Travel. Heading to Jasper, Alberta? Don’t miss Jasper Vacations. No matter which tour you book, you’re sure to have a memorable Canadian Rockies vacation. Call 1-888-659-3394 for more information.